The new OS is designed to improve on battery life and interactive performance of devices, according to Dave Burke, vice president of engineering (Android) at Google. The new release puts automatic limits on what applications do in the background in three areas: implicit broadcasts, background services and location updates. Updated developer previews will become available in the coming months, and devs will get a more detailed look at the OS at Google I/O, to be held this May at the company’s Mountain View, Calfornia, headquarters. Background limits represent a significant change in how Android operates, so it’s important to give developers time to get used to the new features, Burke said. The release is still in its early stages, he cautioned, noting that there are additional features in the works, and plenty of stabilization and performance work to be completed. “Background limits illustrates how Google is moving ahead to improve battery life on Android devices, and support for new/emerging WiFi functions and specs highlight the company’s efforts to stay on the leading edge of device connectivity,” observed Charles King, principal analyst at Pund-IT. Another major new feature is picture-in-picture display for phones and tablets, which allows users to watch a video while they are separately engaged in a chat session or hailing a car ride, for example. The new release gives developers “fine grained control” over various types of notifications, and let users individually block or change behaviors such as sound, vibration or level of importance. 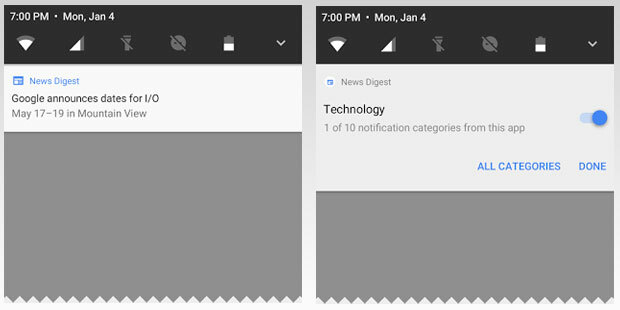 Notification channels let users control an app’s notification categories. Google has seen a resurgence in keyboard navigation with the advent of Google Play apps on Chrome OS, Burke noted. The new OS therefore includes a feature that stabilizes arrow and tab navigation, both for developers and end users. The O Developer Preview has an updated SDK with system images available so it can be previewed on the official Android Emulator and on Nexus 5X, Nexus 6P, Nexus Player, Pixel, Pixel XL and Pixel C. An emulator is also available for wearables, including Android Wear 2.0 and Android O.
Adaptive icons display in a variety of shapes across different device models. The initial release is not available for consumer use, and is available only via manual download and flash, Google said. As the final release date draws closer, Google will open up consumer enrollments through Android Beta. While most of the features are designed to ease developer processes, features like support for picture-in-picture are aimed at improving the user experience, Pund-IT’s King told LinuxInsider. Google’s objective, in part, is to boost the level of consumer acceptance of the new OS, King said, noting that the latest Android version, Nougat, is installed only on a small fraction of Android devices. Two-thirds of Android devices are running Android 6.0 or earlier versions, by some estimates. Google is pushing hard to gain consumer acceptance, as only 3 percent of Android devices are running Nougat and only 31 percent are running Marshmallow, said Karol Severin, an analyst at Midia Research. Older operating systems account for the remaining share of the market. The early announcement will give the developers some time to make sure they can build apps with additional functionality and make sure older apps are running smoothly on the new OS, Severin said. Copyright © 2019 The Shocking Truth. All Rights Reserved.